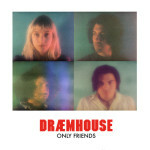 Taken from the band’s forthcoming EP, Only Friends, former Rose Windows members Chris Cheveyo (vox/guitars) and Pat Showe (drums) are joined by Emma Danner (vox/bass) and Brock Carlesss (guitar) to round out Draemhouse. Having released debut single “Woundlicker” in 2015, the band’s four-song Only Friends will be released on 15 March. Stream/download the slow-burning “Mr. Kerosene” below and pre-order Only Friends as a digital download or on limited-edition cassette via Blind Blind Tiger.